Having a three week old leaves me with very limited time to cook dinner lately. This is a wonderful sauce that is ready in less than 20 minutes, but tastes like it’s been simmering for hours. Your family will love it! I buy my turkey sausage from the butcher, but Jennie-O and Purdue make lean Italian turkey sausage if you don’t have a good butcher nearby. You can’t beat a homemade sausage, especially from an Italian Salumeria. 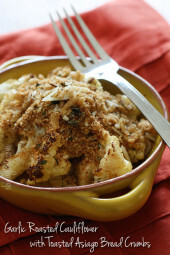 The ricotta cheese gives this a nice creamy texture. Remove the casings from the sausage and saute in a deep skillet. When browned and cooked through, add crushed tomatoes. Add basil and ricotta and simmer another 5 minutes. 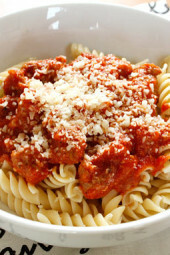 Serve 1/2 cup sauce over approx 1 cup (2 oz dry) of your favorite cooked whole wheat, low carb or high fiber pasta. I made this over the weekend and it was delicious. Thank you so much. This looks wonderful. I would like to use the sauce over zucchini or veggies instead of pasta. Do you know how many points just for a serving of sauce?? Would be awesome to know!! This was amazing tasting and amazingly easy! My family loved it and they can’t wait for me to make again. How many Weight Watches point is this dish under the new smart points? And how many points for sauce alone. I am having it with spaghetti squash. Smart points have been updated to reflect freestyle…don’t have the other info handy…sorry. Hi Gina, what are the carbs, fats and protein for this recipe? I cannot find the other nutritional information. Please let me know! Thank you so much. This recipe looks simple and delicious. I would love to try. I will look into it and let you know. It is updated now. Thanks for noticing! I just made this and the ricotta curdled I think. And my sauce was pink like the above reader mentioned. I think I would just leave the ricotta out all together next time. 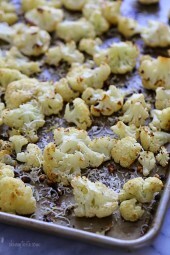 Loved this recipe, low fat and for me low carb. I used a spaghetti squash instead of pasta and it really was to die for. I grew up in a home with no healthy cooking so this has been a real help to me as I am changing my lifestyle to one of health and yummy foods. THANK YOU! Can you tell me if you think this would work substituting nonfat cottage cheese in place of the ricotta? Thanks so much! Made this for dinner last night, but used chicken italian sausages instead of turkey and it was absolutely wonderful. Can't wait for leftovers today, as I bet the flavors are even better! I have a feeling I did something wrong. I followed all the directions and measurements, but the sauce turned out more pink then red like yours. Yes whole tomatoes would work. Hi Gina. I am wanting to make this recipe and found that I have a 28 oz can of peeled tomatoes as opposed to crushed tomatoes. Is this an ok substitute? I must admit, you're website is by far one of the best I have found EVER!! Thank you for all of your hard work!! We had this receipe just last week and it was WONDERFUL! I have 20 month twins who loved this, and to get them to both enjoy a receipe, you know you did good!! This is something we will definitely make again. Thank you, thank you, thank you!! This was easy to throw together. I used ground turkey breast instead. But the only basil I could find was lemon basil.. Which my bf didn't care for. But I thought it gave it a unique twist. I just put this into recipe builder…doing PP+ and it came out 8. Thanks for the recipes. I have been sharing them with everyone! Love the real food that my family loves to eat. May grill some zucchini summer squash with it tonight for dinner:) Thanks! Sorry you couldn't find it but low fat is the next best thing. Gina i could not find fat free ricotta in my area. Strange enough because i went to two stores. I ended up using low fat ricotta and the dish came out so tasty. This one will be a regular dish in our home! I am so blessed to have found this site. It is making my WW experience this time around so worth while! Thanks Gina and God Bless! Hi Gina! I tried this recipe tonight and realized I am using lowfat ricotta cheese. How would this change the point value? By the way this is my third recipe i'm trying on your site and I LOVE EVERY ONE SO FAR! Thank you for doing this! Can you tell the new points on this recipe? Becky- Yes you can substitute turkey sausage, it's just hard to say how much fat is in them. All brands vary, I think Jenny-O has a lean one. One of my favorites, and when I'm wanting to 'beef' it up a little more, I add chunks of zucchini, bell pepper, onion, and mushrooms… All my food groups in one bowl! We love every recipe from your site! I use hot turkey sausage for this one and my husband loves it! @SouthernGirl- yay, I'm happy you liked everything you tried so far. Thanks for spreading the word. Hi Gina, I came across your website over the weekend and have tried a couple of recipes so far (including this one) and they've all been delicious. I for one, am culinarily challenged but love great food so this site is a lifesaver. Thank you so much for sharing. I'm going to spread the word about this site! just made this for dinner and it hit the spot! i paired it with a salad. i used hot italian turkey sausage and italian seasoning (because i didn't have basil). mmmmmmm! @Kassie – cup of Spaghetti Squash is 0. 1/2 cup of just the sauce is 3.25 so it's 3.25 total. @Sara- Congratulations! Yes, I ate healthy throughout my pregnancy and worked out. Makes a big difference! Glad they liked it! I'm 19 weeks into my first pregnancy, so recipes like this are good even now! I made this for my husband and his friends, who are very picky eaters, last night. When I got home from church, there was none left. Needless to say, they really liked it! 1 cup of Spaghetti Squash is 0. 1/2 cup of just the sauce is 3.25 so it's 3.25 total. I made this last night, but used spaghetti squash instead of whole wheat pasta. How many points would it be for 1/2 cup of your sauce over 1 cup of spaghetti squash? It really depends on the sausage. If it's lean, it should be about the same but check the nutritional facts to be sure. @Emily – Wow, 6 kids!! Do you have the secret on Sleeping at night?? I made a similar recipe before but using lean Chicken sausage instead of Turkey sausage. 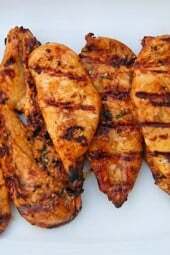 Is turkey healthier and does it have less calories compared to chicken? I love whole wheat pasta – it's proof that healthy can taste delish. Love, love, love, this-Quick and easy & to the point! 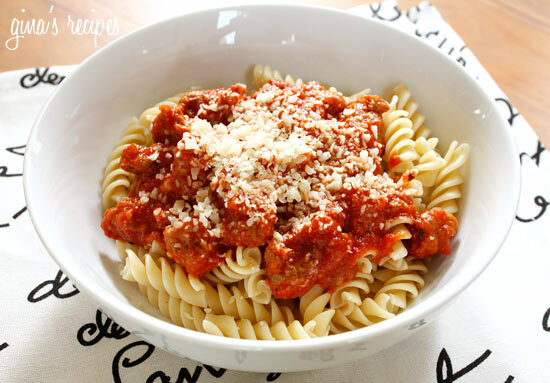 this sounds great – i love quick pasta sauces like this. my mom has a homemade sauce, but it takes hours, so it's kind of a make ahead thing. this is perfect for weeknights! I'm new to your site but I am already addicted! I made this tonight for myself and my boyfriend, it was a huge hit! It was delicious!! Made the pasta this weekend and it was a success!! I have 6 kids, so finding something everyone likes can be tricky. Thank you thank you thank you! Congrats on your new little one. Enjoy this time. I am so excited to have found your blog that i mentioned you in both of mine (i have a regular blog & a weight loss blog). I just started cooking in 2008 but this year one of my new year's resolutions is to learn to cook healthier meals. So thank yo so much! YUM! Turkey sausage… I'm going to have to try this one out. ps- Love your blog. The posts, the pictures, the lay out… I love it all! Gina…your recipes have helped me to lose 40 lbs. on WW! Thanks so much, and I can't wait to try this one! Congrats on your new addition! @Going Clean – Wow, sure is easy, isn't it!! The best sauce ever is my Bolognese Sauce. Takes a little more time so make it on a Sunday but it's outstanding!! Thanks so much for sharing your amazing recipes. made this tonight, my husband said it was the best sauce i've ever made….Thanks Gina! This looks healthy and delicious, Gina! Congrats again on your new little one! Thanks everyone for the wonderful comments!! @ Catherine – happy blogging! @ Tamkaleta – Chicken Parm, such a classic!! @ Jenn – Chicken Sausage would work out just as good for this dish! @ heather – I gotta hand it to all the Moms out there with 3 to 4 kids!! @ Going Clean – I used about 1 tbsp dried basil. @Anonymous – I started WW before I got married to lose 10-15 lbs. I was doing no carbs prior to WW. I lost the weight so quickly with WW and I was very impressed. I like the fact that you can eat everything in moderation and this is really a healthy diet. After I lost the weight, I continued with WW to maintain my weight. My metabolism isn't what it used to be in my 20's so if I don't eat healthy and exersize I gain it back in all the wrong places. I'm only 5'3 so 10 lbs, even 5 lbs shows. Now that I had a baby, I'm not sure how much I gained, but I am confident it will come off quick sticking to a plan and hitting the gym once again. I just stumbled onto your blog and have been cooking your recipes this week my husband, kids and i love the food and i have already lost over two lbs this week. thanks so much!! I'm sure you do have limited time to cook! I have 4 kids (youngest is 1) & sometimes I find myself coming & going! Thank you so much for posting a new recipe! This looks absolutely delicious & next time I'm able to make it to the store (we are currently snowed in right now) I'm going to pick up the stuff to make this! Perfect timing since I have a coupon for turkey sausage! I had something similar last night – with chicken sausage! It was so good! What a beautiful new addition! You are blessed! Your latest recipe sounds great! I use a chicken Italian Sausage that I purchase at BJ's Wholesale Club. It's very tasty, I think I'll try this tonight! Thank you for all your tasty recipes! I recently discovered your site as I was looking for new weight watcher recipes. I love how each recipe is accompanied with a beautiful photo. Not being terribly computer savvy, I could not find "your story". I was wondering, how much weight you have lost with weight watchers and how long it took you to lose the weight? I love your recipes! Congratulations on your new precious addition also. My family LOVES your skinny chicken Parmesan. This looks wonderful! Thank you. And the fact that it's quick is even better. @ Sue, it's not easy but luckily Daddy helps with her. I'm sure my next few recipes I publish will be ready in less than 20 minutes! Someone pointed me towards your blog and I can see that I'm going to enjoy it. I can't imagine cooking at all with a 3 week old, but I'm looking forward to the things you make. Congrats on the new baby! That does sound good. I am going to make it, probably next week. Congrats on the new addition! That's such a nice New Years gift. A light and easy meal makes sense of course. I haven't had turkey sausage in a long time. But now with this recipe, I have a perfect excuse to go out and buy some!